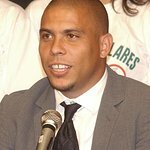 Ronaldo is a Brazilian professional footballer. He currently serves as an ambassador for the United Nations. In this role, he has been to a number of countries afflicted by war. In 2000 he travelled to Kosovo, where his presence was welcomed as a positive force for promoting an end to hostilities. In 2005, he visited Israel and Palestine as a peace emissary, helping to encourage unity between two peoples who have been driven apart by decades of conflict. We don't have any videos related to Ronaldo.